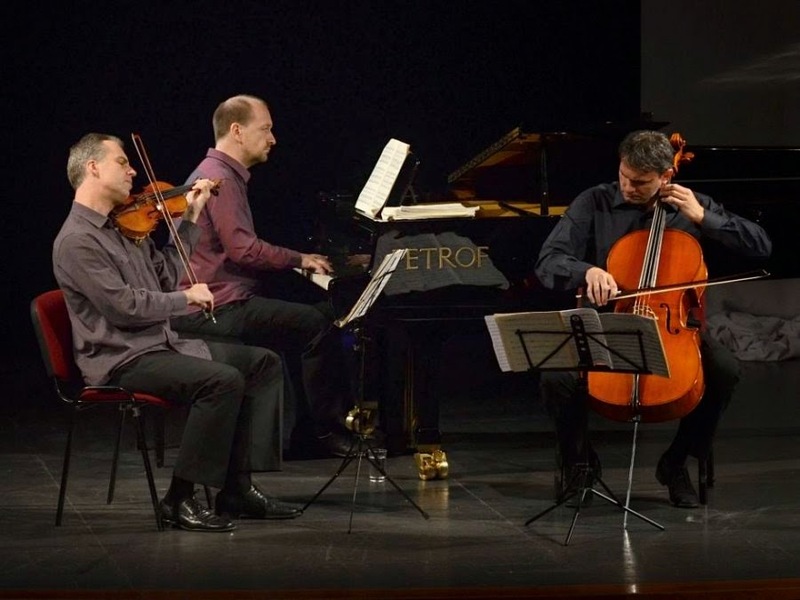 For their UK debut performance at Queens Gate Terrace on 18 February 2015, the Prague-based Trio Martinu chose the substantial pairing of Dvorak's first piano trio, the Trio in B major, Op.21, and Schubert's last, the Piano Trio in E flat major, Op.100. The group's players, Pavel Safarik (violin), Jaroslav Matejka (cello) and Petr Jirikosky (piano), have been playing together since 1993 (the group was founded in 1990) so clearly Britain has been missing out on some very fine chamber music playing and it was good to be able to hear the group finally, and especially in such an intimate setting. (Before the concert I met up with the players to chat, and you can read my interview with on this blog). Dvorak's Trio in B major, Op.21 is his first surviving piano trio (and he would go on to write three more), and was written in 1875, the year after his Symphony No. 4. It is a substantial four-movement work. The opening movement started with a calmly beautiful introduction, before launching into the Allegro molto proper. This was lively indeed, with the players full of energy and extremely responsive to each other. There was always a sense of the different combinations of instruments collaborating naturally. They made a balanced and collegial sound, without any feeling of individuals showing off. There was a lovely sense of sprung rhythms and flowing melody which is important in Dvorak, who gave us his usual profligacy with musical material. The two string players were very sweet toned, without too much vibrato and all were able bring a live lightness and transparency to textures. The second movement Adaigo molte e mesto opened with a gentle and thoughtful piano solo, before being joined by the cello for a mellow and melancholy duet, finally the violin with a lovely sung melody and then a fine interplay between the instruments. In the passages where Dvorak writes for the strings in unison, pitting them against the piano (though this is the least combative of works), it was noticeable what a wonderful sense of unanimity Safarik and Matejka had. And the movement concluded with some magical textures. The Allegretto scherzando was shapely and skittish with a sense of fluidity in the playing, with a natural ebb and flow. This natural interplay was also noticeable in the Finale: Allegro Vivace combined with a perky crispness at times. Throughout, though, the textures of the music were beautifully modulated and considered, this was deeply thoughtful music making. Schubert's Piano Trio in E flat major, Op.100 was one of the last pieces that he completed and it was one of the few late compositions that he heard played. In the opening Allegro the players contrasted a robust vitality with a nice delicacy, and later in the movement they brought out the real intensity of the music. Their performance had a sense of underlying steadiness, but enlivened by hints of skittishness. Again the two strings had a lovely unanimity in the shaping of their phrases. The well known melody from the Adagio molto e mesto is first articulated by the cello and Matejkka gave us a finely modulated performance of the famous tune with the long sung line pointed by articulation. Throughout the movement the players showed a magical control for the delicate textures, whilst giving way to robust intensity in an instant, with some thrilling climaxes. There was also a strong sense of classical poise offsetting the romanticism of Schubert's music. Schubert's third movement, Scherzando, went with a lovely lilt and some nicely playful hints in the interactions between the players. The middle section was more robust, but still with a nice lilt and the concluding pages has a lovely insouciance about them. For the long final movement Schubert combined a rondo with sonata form, and included a modified version of the second movement melody in one of the interludes, thus making the movement seem more like a reminiscence of the whole work. The trio's performance had a steadiness to it, but with plenty of character, and the more scherzando episodes had a underlying strength to them. The echoes of the previous movement were lovely, and the whole had a very fine sense of structure. This was a deeply felt, but poised and classical performance which was rarely over emotional but had a clear inner strength.